Grimey pub with two halves - one resembling the rundown lounge half of an estate pub while the other was like a greasy spoon caff. Ale was nothing special and London prices but if you are stuck here there are no other options. Pretty well exactly as lezford found except we managed to eat and the food was excellent. Lovely homely feel with excellent local ales. Two steam trains passed over the infamous viaduct as well that day. Normal trains run roughly every two hours from either Carlisle or Leeds and the pub is 2 minutes walk away. First pub of the day and as I've always wanted to visit the viaduct at Ribblehead it made sense to stop at the Station Inn. 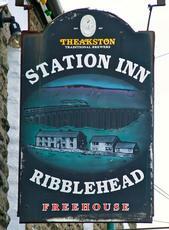 The Station appears in the 2014 GBG and is certainly in an isolated spot on the dales. The 3 ales on offer are all local ales, I opted for a half of Wensleydale Bitter @ 3.7%. Two large rooms with the front room as you enter laid for food. We missed lunch by 30 minutes so had to settle for pork pies, which we took with our drinks and sat in the lounge where the pool table was, television was on showing the previous nights football. Large rear garden that overlooks the viaduct and the bleak moors. A friend of mine said that his "pie and peas" was a small microwaved poor-quality pork pie with a small portion of sugar sweetened peas. Costing £5 plus, he said it was the worst tasting and poorest value he'd ever had. He also said the beer and main meals were expensive. Had the Station Ale - not sure who brews it for the pub. It was a passable beer as we sat and enjoyed the view from the back of the pub over to the viaduct and the snow-covered Whernside peak behind.